Note: William Bartram first came to Florida in 1765 with his father John, who was exploring the new British possession for King George. 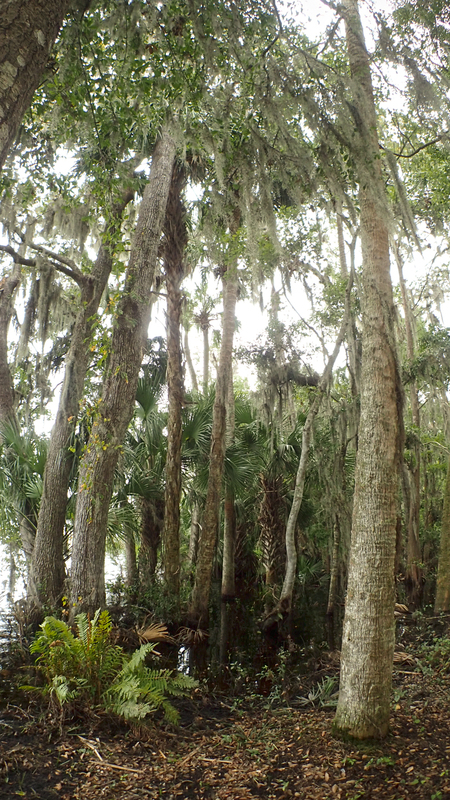 After failing as a Florida plantation owner, William, aka Billy, returned to Florida on his own in 1774 and in 1779 published an epic narrative of his journeys throughout the southeast titled Travels. His lyrical prose inspired a generation of writers and naturalists to follow – they continue to inspire people today, including myself. 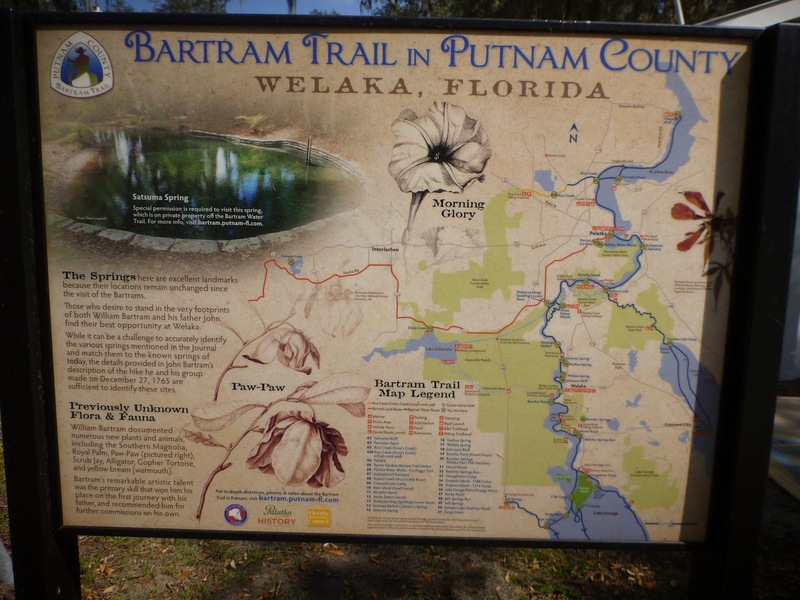 Even though there are historical markers and signs marking the Bartram Trail throughout the state, the small city of Palatka seems to have taken ownership of Bartram in Florida. 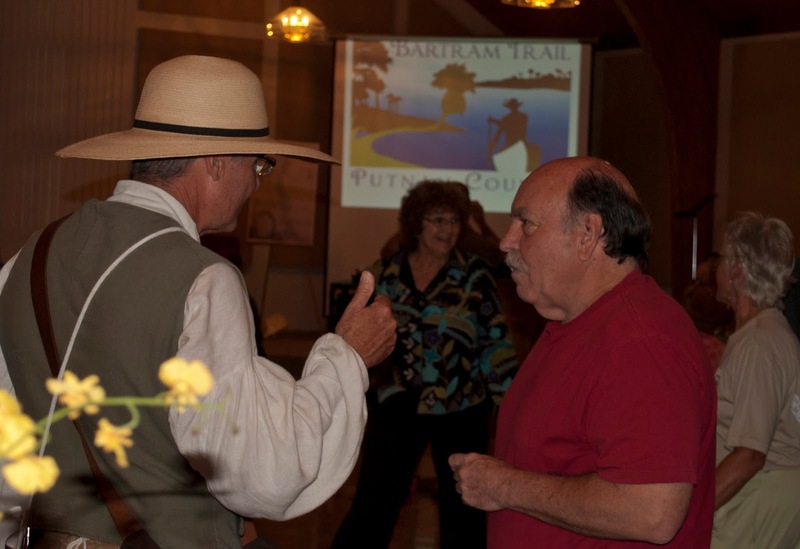 Their festival of all things Bartram is known as the St. Johns River Bartram Frolic, a reference to a Native American ritual at Spalding’s Lower Store called the "Indian Frolic" in William Bartram’s writings. 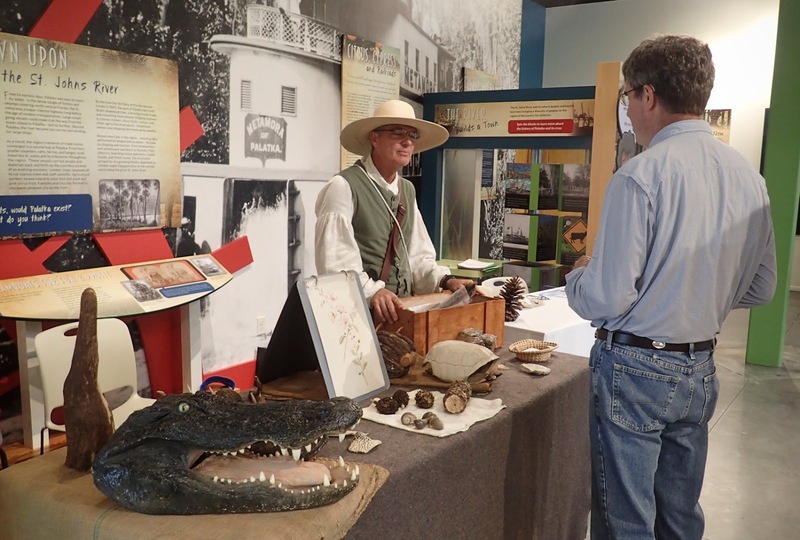 The two-day long event held the last weekend of September features historical reenactors, boat excursions, hiking, biking, and kayak tours, art, music, and a symposium featuring Bartram presentations. 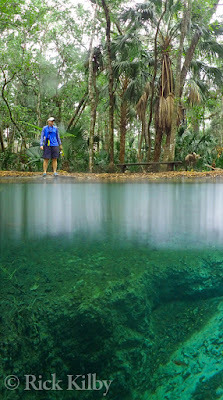 My first foray into the Frolic was a kayak trip to two of the springs visited by Bartram: Satsuma and Welaka Springs. The forecast looked bleak the day before the excursion, but the overcast skies resulted in comfortable cooler temperatures. The water of the mighty St. Johns looked like swirling black ink and it was still swollen from the passage of Hurricane Irma three weeks prior. 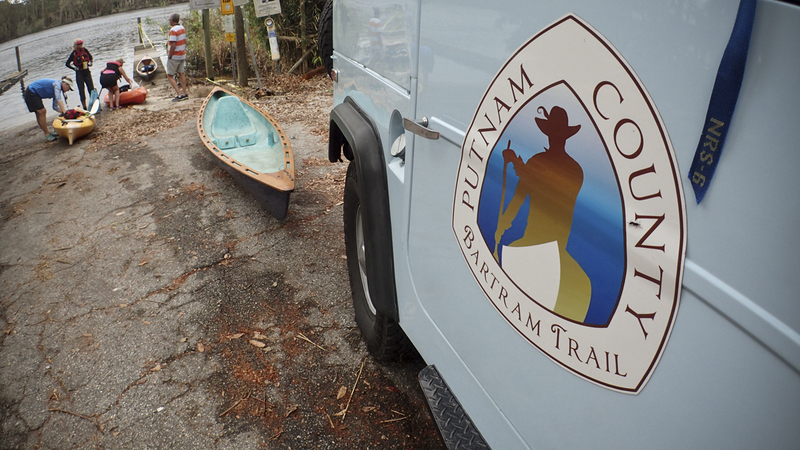 Our mission was to follow the route that was explored by John and William Bartram on December 27, 1765. A short paddle up river led us our first stop at Satsuma Spring, a site described in John Bartram’s journal but only recently discovered by our tour leader, Bartram aficionado Dean Campbell. From the river the spring run was impossible to detect, only by interpreting the topography was it found, as much of the east side of the river is composed of steep bluffs, and springs can only at low points along the river. The spring is located on private property and the Bartram festival organizers had arranged our visit ahead of time with the owner. 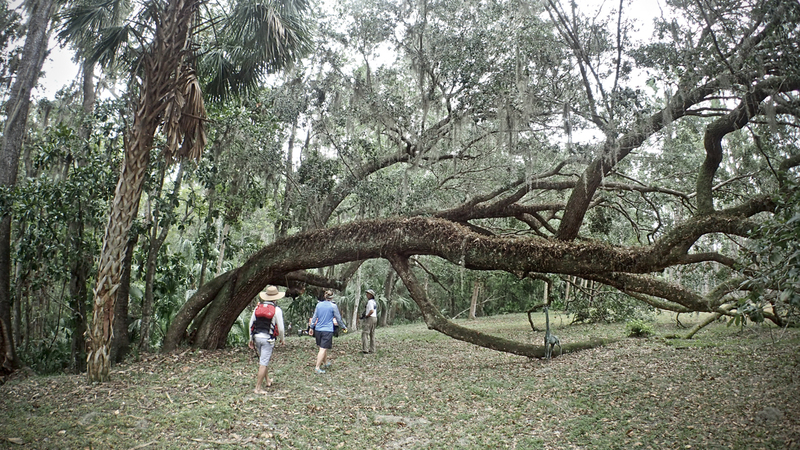 A nearly horizontal live oak guards the spring’s entrance and our tour leader informed us that Native Americans often intentionally bent trees to indicate the presence of water sources. The spring is in a small ravine and the owner had lined the path with mulch to cover up the mud created by Irma. Confined within a semi-circular basin made of cement filled-sand bags to prevent erosion, the spring wreaks of sulfur, one of the clues that linked it to the Bartrams. 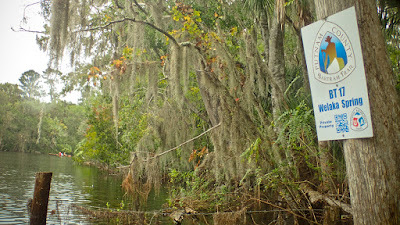 John Bartram’s journal described the spring this way: "a large fountain (big enough to turn a mill) of warm clear water of a very offensive taste, and smelt like bilge-water, or the washings of a gun-barrel...." The smell of sulfur, while stinky to most made one of my fellow paddlers feel nostalgic as she explained that she grew up drinking sulfur water and actually liked the smell. 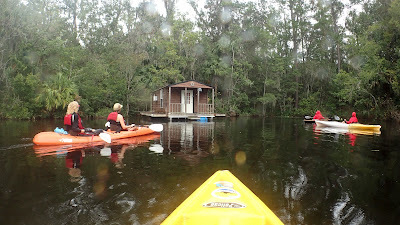 Another paddler claimed that it made an excellent mosquito repellant and drinking the water would keep the bugs at bay. 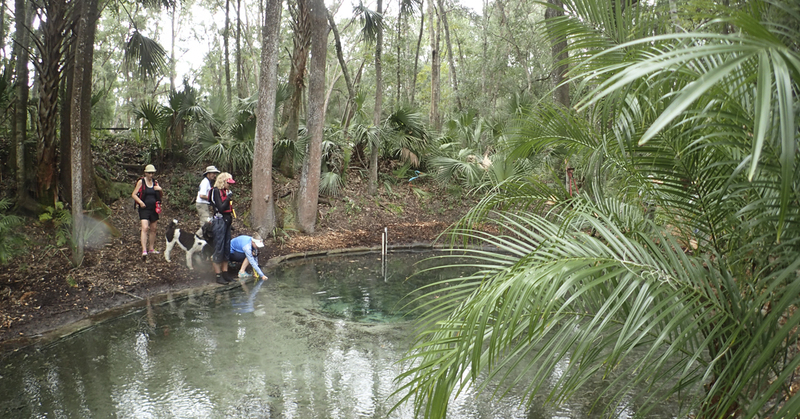 The property owner told us that the torrential rains from Irma had “opened up” the spring and improved its flow. 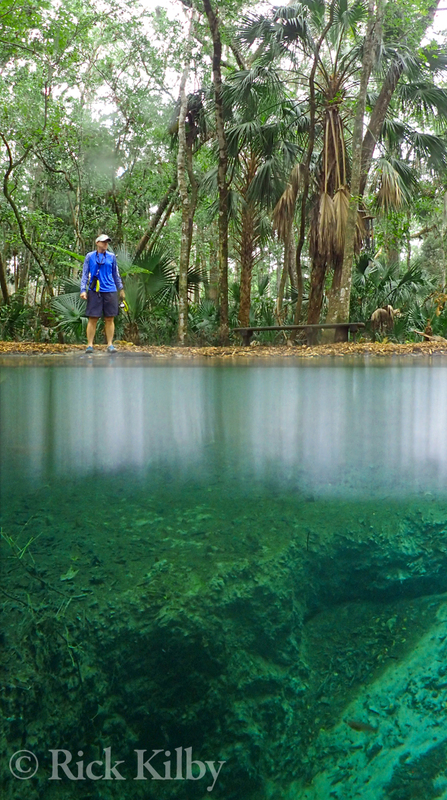 On this gray overcast day the spring water possessed the distinctive cerulean hue I’ve come to associate with Florida’s most beautiful springs. 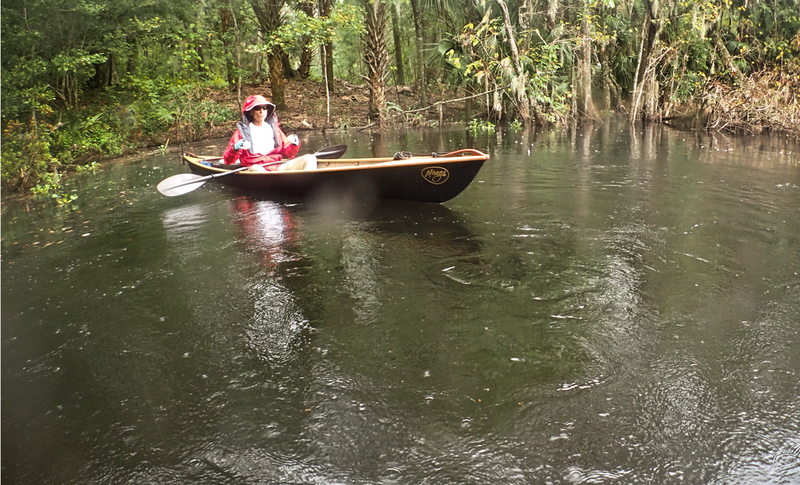 After a few minutes of soaking in the history and natural beauty of this 3rd magnitude spring, we returned to our kayaks and paddled on. Next was Nashua Spring, also on private property, but in this case we could see nothing more than the Bartram Trail sign marking its location on the river. 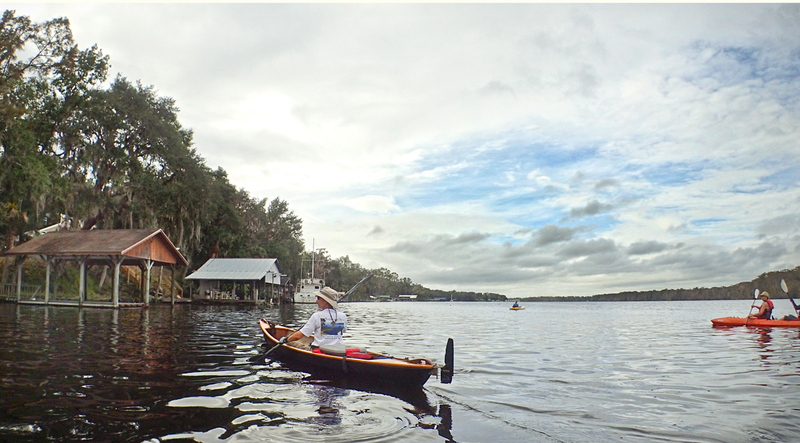 We paddled on, under leaning live oak limbs, around newly downed tree trunks, and past a half dozen locals in powerboats throwing cast nets in the pursuit of shrimp. 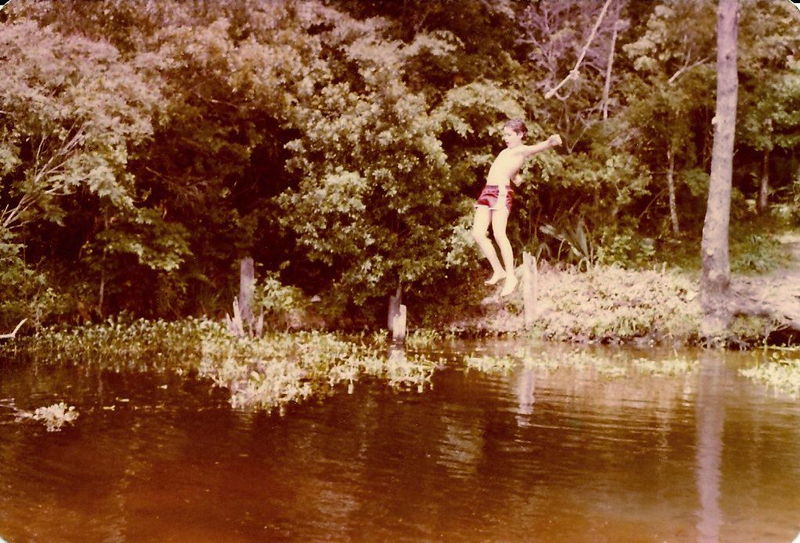 At Turkey Island we turned left into a cove towards Welaka Spring, another third magnitude spring – one I remember fondly from my adolescence. When I was teen my friends and I would trek up this cove until water hyacinths impeded our progress. Then we’d be forced to wade the rest of the way through the dark water, (with the hyacinths at face level), until we reached the spring. There was a rope swing and one could swing out right over the spring boil and plunge into the freezing water, an oasis of clarity in the otherwise root beer-colored cove. 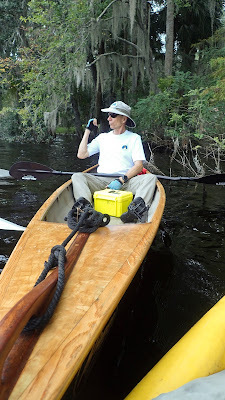 As we paddled to the spring I notice immediately, (with great glee), that there are no longer water hyacinths to be found anywhere. The only object near the spring is a floating house – a homemade houseboat on pontoons – positioned adjacent to the boil. 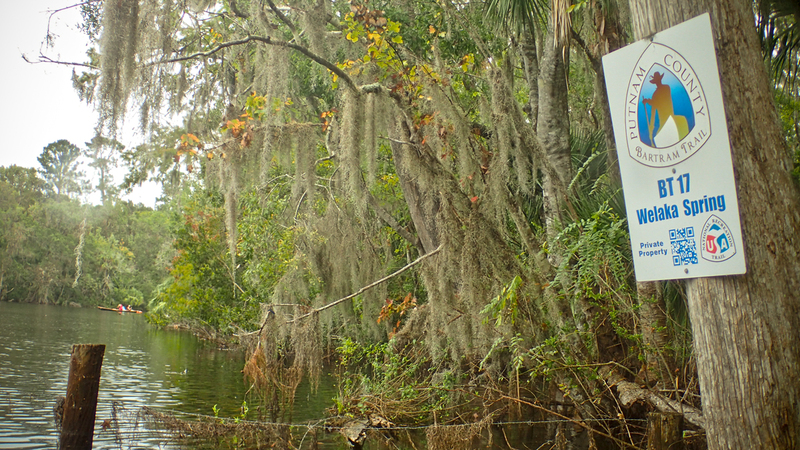 The spring is “browned out”, meaning the water level of the surrounding river is so high that the brilliant blue hue, so noticeable at Satsuma Spring, is not evident here. 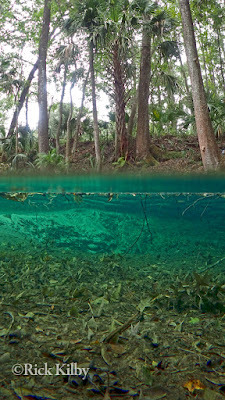 There is, however, a significant boil on the surface indicating a high amount of water flow. 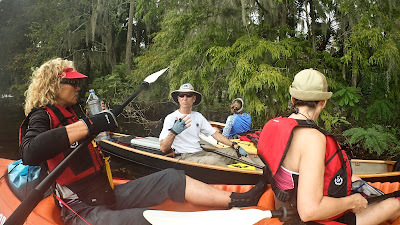 While our tour leader relates anecdotes about the spring’s history, the rain we had dodged earlier began to fall gently, and we paddled back down river to our starting point, following the Bartrams’ footprints and grateful that they can still be found over 250 years after they explored this location. The next day the featured event of the Frolic was the Bartram Symposium with five different speakers. Despite persistent rain, an enthusiastic audience of about 65 people enjoyed close to three hours of presentations about the 18th century botanist and explorer. 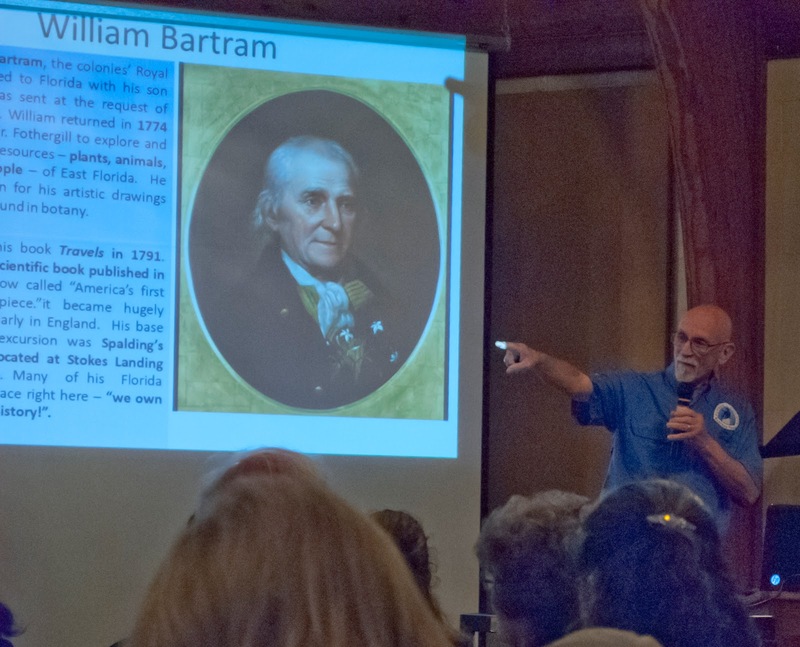 Over-sized framed prints of William Bartram’s drawings ringed the room and a Bartram re-enactor was on-hand, posing for selfies with eager Bartramphiles. The first two speakers were co-authors of Travels on the St.Johns River, a book devoted entirely to the Bartrams expeditions up and down the river. Thomas Hallock, a professor of English at the University of South Florida St. Petersburg, gave a brief Bartram overview and co-author Richard Franz, an emeritus scientist at the Florida Museum of Natural History, discussed the flowers Bartram observed along his trip on the St. Johns. Next the Environmental Archaeology Collection Manager at the Florida Museum of Natural History, Irvy R. Quitmyer, talked about the archeology of the region, specifically the indigenous people who lived near the river before the Bartrams arrived. Brad Sanders of the Bartram Trail Conference next discussed plans to attempt to designate a Bartram Heritage Corridor along the routes traveled by the Bartrams (seven states in total.) The Symposium concluded with an animated presentation by Bartram muralist and reenactor Dean Quigley. William Bartram’s travels were published just 15 years after America declared independence from England. His powerful spiritual descriptions of what he encountered in Florida inspired writers and authors of the period, from the poet Coleridge to influential transcendentalist Henry David Thoreau. 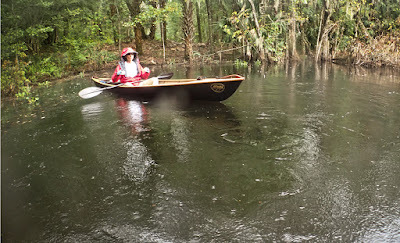 What I learned from attending the Bartram Frolic is that his beautiful words still echo up and down the St. Johns River and they still have the power to inspire. What an amazing legacy. 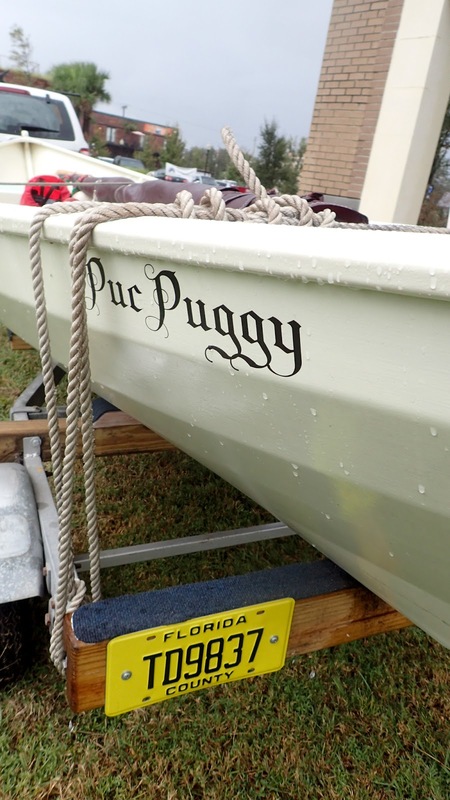 The Seminoles named William Bartram Puc Puggy which means "Flower Hunter"